The aim of this extension is to provide a small game for users to train them out of (or at least help them recognize) the social training they have been conditioned into following that dictates gender norms, gender stereotypes and so on. Users are able to Highlight words in their every day internet browsing which then allows them to virtually erase that word on the webpage, even if just for those few moments. The point is not for users to erase these pronouns from their every day existence but for users to become more clever about spotting them, understanding how they are used and piecing together whether or not they hold any 'natural', social, or personal importance. To Further encourage user's exploration of this system, a small gaming component is present as a drop down menu . 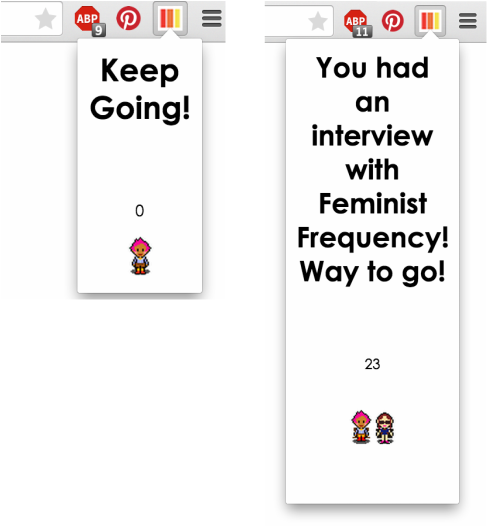 The menu counts how many gendered pronouns the user has thus far eliminated, and also provides a small character that the user is controlling with the amount of words they collect, the character, much like the user, begins humbly and slowly begins to work up to different special events based on the words the user collects. The extension offers a lot of room for exploration and I encourage users to get playful, inquisitive, and excited. In this excerpt Gloria Steinam's "I want a wife" is taken to new extremes since the parallelism between wife and slave is all too apparent when the word 'wife' is erased.